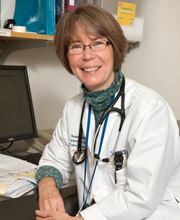 Susan Hadley, MD is Professor of Medicine at Tufts University School of Medicine and Attending Physician in the Division of Geographic Medicine and Infectious Diseases at Tufts Medical Center in Boston, Massachusetts. Dr. Hadley received her medical degree from the University of Florida College of Medicine in Gainesville, Florida. She completed an internship, residency and chief residency in medicine and a clinical and research fellowship in infectious diseases at New England Deaconess Hospital in Boston. Dr. Hadley also completed a clinical effectiveness training course at the Harvard School of Public Health. Dr. Hadley is board certified in internal medicine and infectious disease. Dr. Hadley’s research interests include clinical and molecular epidemiology of fungal infections, antifungal susceptibility methods, design and implementation of clinical trials, and infections in immunocompromised hosts. She is the author or coauthor of numerous peer-reviewed articles, abstracts, and reviews. Her writing has been published in such journals as New England Journal of Medicine, Annals of Internal Medicine, Journal of Clinical Microbiology, and Transplantation. Dr Hadley is a member of professional associations including the Infectious Diseases Society of America and the American Society for Microbiology and served as Co-chairman of the Education Committee of the Mycoses Study Group.